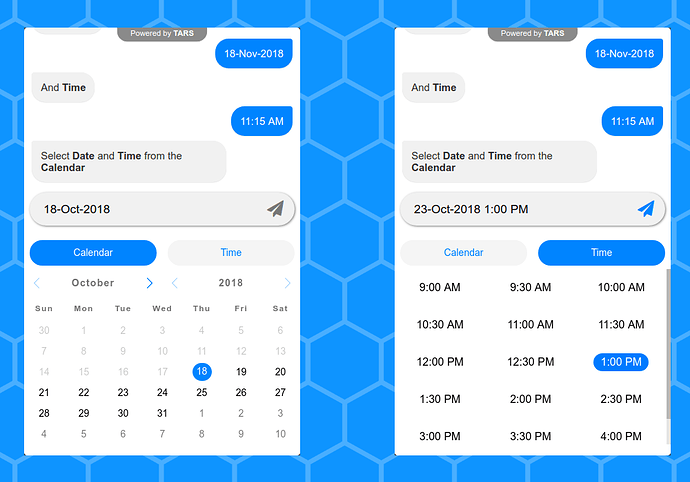 The user can select the Date fom the Calendar UI and then select the available preferred slot right after that, and then send it across in the chat. If they cannot find a preferred time slot for the selected date, they can go back and pick another date. This is a good opportunity to introduce our new team member here at TARS. I love it!! Is there a way to set the Min Date to something like 3 days in the future? The logic is that you don’t want someone to be able to schedule an appointment during a time that you might already have booked or at least so that you have some time to contact them to reschedule if they happen to book during a time you already have booked. So for example, a booking plugin I use on Wordpress sites allows for dates 0-30 days in the future as the minimum lead time. This would open up a lot more flexibility. Also, adding a set of business hours would be helpful too so that you could constrain when someone could schedule. The way it is set up now they could schedule 7 days a week but only during the start and end times. I work with companies that work for example 8-5 M-Th, 8-4F and 9-1on Saturday. It is a great start but just needs some additional parameters to be really usable. Thanks for your response. I agree with you. In order for this to be a real viable solution for people to use to book appointments, all the above mentioned feature is very necessary. For that, we plan to make a Google Calendar integration with the Calendar Time InputUI, so that you can configure all those constraints in your Google Calendar and it will allow only available time slots to the user to Book the appointment. It will even book the apointment on your calendar and show only available slots to the next user in real time. Would you use this more often, if we build something like that? I think that would be best as it would allow the most flexibility. Any idea when that would be implemented? Targeting to release it by this month itself. That’s awesome! Love the continued integration options! 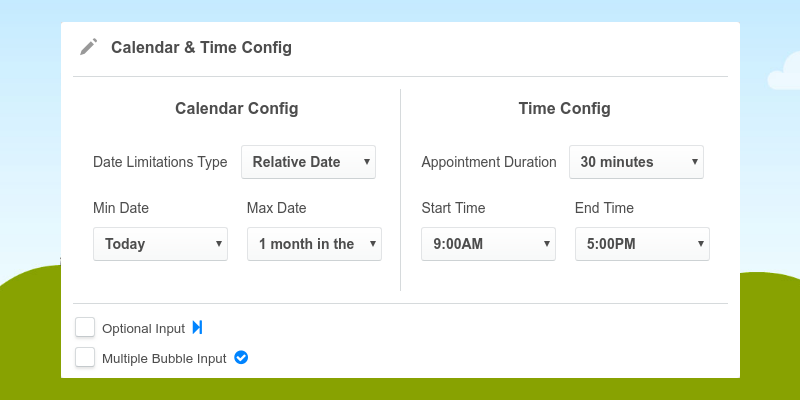 Hi Vinit, I was thinking about the calendar integration and it would not solve the “you must book three days in advance” problem because you would always have to go in and block out the next 3 days on your calendar in order for that to work. Is there a way to add the earliest date to be in the future ? I love the idea and one of my bots has a lot of activity that I think would convert better if done this way instead of redirected to a separate scheduler. If it is just the minimum date selection to be some days in the future, then it is possible even right now. This has to be done in the code view of the gambit and has to be done from our end. Ping me on the live chat help on the Dashboard and let me know the Bot ID and the Gambit ID for this and I can do it. Can we have the “Timezone selection” feature too? This is very helpful when we are doing the appointments bots on our sites. And get that converted into the desired timezone format. If someone from USA selected the time, then it should be converted to us in the IST format. Another scenario, We can have an only certain time of the day available. So that the other countries will be feasible to book an appointment for that time. As we have social time, and other things too. And is the integration google calendar is done? let me know if it is done. Yeah TimeZone option is something we have to figure out. How can we implement it so that the bot figures out the the TZ, with least amount of configuration needed. We can divide the timezone by blocks. In the bot calender setup, we can select the country we are targeting in the ads. There are different options like UK, USA, Australia etc. Once we select the country, then we can pull only those selected timezones for the customers. It will be way better for the users to choose it. This can be a potential lifesaver. 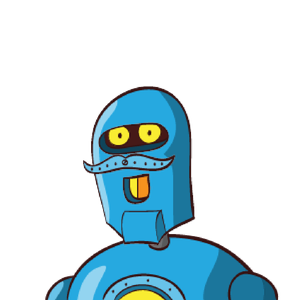 We can then use such chatbots for recruiting specific customers to meets at their home. Can it be done so that we choose time intervals that are not back to back. Lets say I want 1-hr time slots that are 10AM-11AM, 12PM-1PM, 3PM-4PM etc?, can that be done? This allows me to have a transit time between meetings. And can I allocate a quota to each time slot? Lets say the 10 AM is for 2 slots, 12PM is just for one etc.? Sorry I posted a request. And it mirrors what Jeff had asked. Yes please if you can get this done, it will be awesome! !